Really, number of salmons in the rivers can be predicted. As a basis it is possible to take the data of calculation of real quantity of fishes in the rivers. With some share of objectivity it can be made there where there are special counters of fishes which come into the rivers. If we have such data for some years then it is possible to argue with some confidence on the future season. As a whole the quantity of salmons in the river depends on set of factors. The negative factors - most known to us it is fishing pressure and poaching. But these factors concern adult population of fishes which never reached on our rivers of hundreds thousand or millions fishes. Therefore major factors which add or take away thousand and millions fishes are spawning and the sea period of life of a salmon. Unsuccessful for spawning river condotion or catastrophic winter and fast spring high waters reduce population of next years by thousand. The adverse situation in the sea also can lead to loss of tens and hundreds thousand young salmons which have put to sea from the rivers. In my opinion, it is major factors which can cardinally change number of salmons in the rivers. 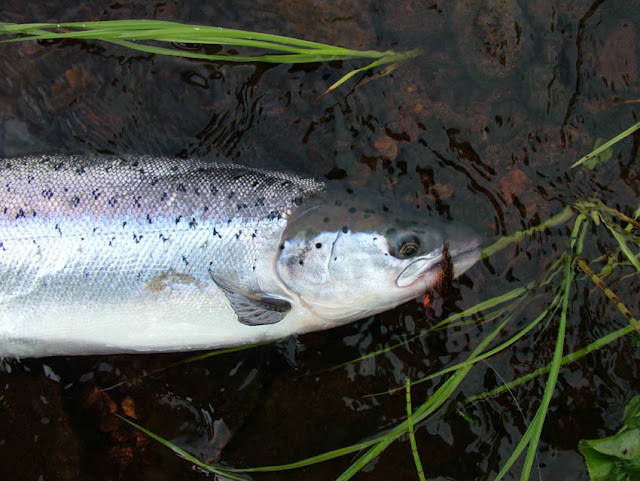 For spawning of a salmon it is possible to present alternation of successful and not so successful periods, as a sinusoid with peaks and falling number of smolts. Probably, this natural sinusoid has frequency in 7-8 years. The situation in the sea defined by currents, in temperature and forage presence too changes from favorable to bad about periodicity in some years. Probably, all repeats time in 14 years. Whether all depends it on a solar cycle and more any reasons, I do not know. Imposing of these cycles, spawning sinusoids on a sinusoid of the sea period of life gives the sinusoid which loses a correct rhythm and is characterised by non-uniform peaks with population splash, then with decrease or sharp recession. I `m not a scientist , I`m trying assume only about the reasons of change of number of salmons on own supervision for 26 years of my practice of fishing. I have once again watched recently a film about Peter Powell's work on the rivers of pool of Barents sea. All was pleasant to me, but I am sceptical about its figures and statistics. The increase in number of a salmon in these rivers quite keeps within natural fluctuations of population if to extrapolate the data 45-20 years prescription for our time. If to speak about the rivers of the White Sea in my opinion we have taken place a failure in number of a salmon in 2008-2011. The previous maximum of quantity of fishes in the rivers Chavanga, Chapoma was observed in 2003-2005. If the total sinusoid taking into account a river and sea cycle is correct (which can fluctuate with frequency in 11-12 years), since 2012 - 2013 can be expected new lifting of number of a salmon in the rivers of the White Sea. Here is statistic-------- salmons q-ty x1000 ------ during 1964-1992, White Sea pool. ------------I'm not a biologist either, and I have a fair amount of respect for the science, but my observation is that the annual returns are very hard to predict accurately even one year in advance! Theoretically grilse should be predictable based on the previous year's smolts, and 2 MSW salmon in abundance relative to the previous years grilse - since they come from the same crop of smolt. Older virgin spawners are relatively few, and repeat spawners make up a much smaller precentage of the run, and their numbers should be fairly stable. Put that all together and predicting the size of the run seems achievable enough. But it often doesn't work that way. 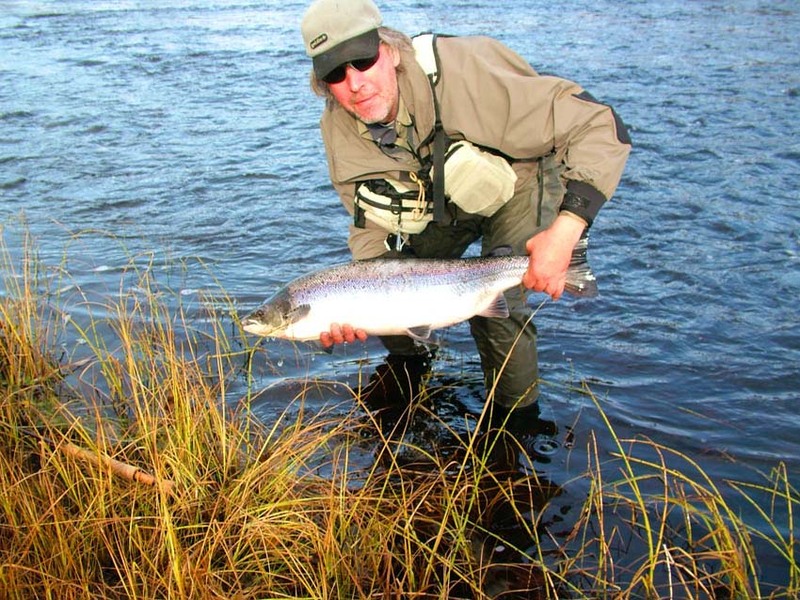 Two years ago we were to have braced for a poor run of salmon based on a near record small grilse run. Instead we had the best run of recent times. Personally I'm also skeptical of predictable long term patterns or cycles of fish populations. --------Before we messed it up (the ocean and climate) there were distinct population cycles of salmonids (at least here in NL). We have netting data that proves it. Same nets in same spots and a nice clean cycle. Dr. Dave Reddin of DFO (NASCO, ASCF, Scientist Emmeritus with DFO, etc) showed it to me 20 years ago at a meeting. 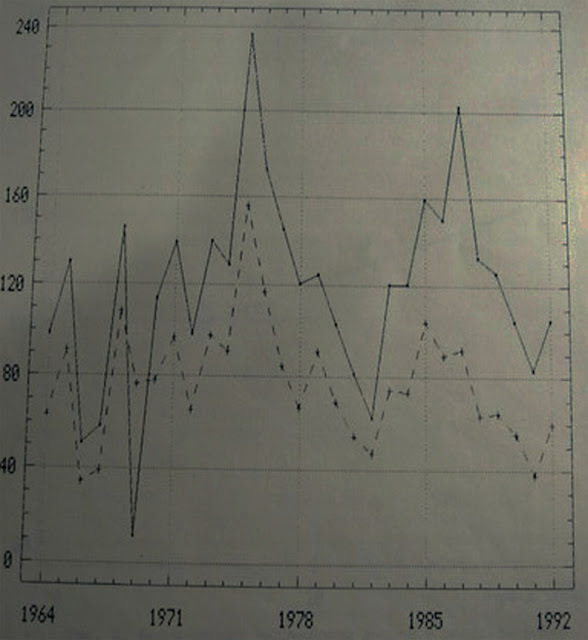 A many decades long data set with a trend you could drive a truck through.....no p=0.35 manure...a nice clean line of dots. But of course we have messed that up and now no one knows what's going on..
Biggest smolt count in history of our biggest river (100% increase! )....we were all sharpening our hooks all winter....result - poorest run in years! One river has a bonanza and another 10 km down the road has a 25-50% reduced run compared to the 5 or 10 year average. eg 1 Draggers can scoop up half the run from a small river in one tow! Salmon tend to stay together at sea...we know that now. the examples are endless...the ocean is in a mess!!! It ain't rocket science. Now we also have global warming and weird river conditions...and logging...and "____".....but the rivers are not in as bad a mess as the ocean. Anyway guys.....lets change the subject....its too depresssing....we can't undo the mess we made....we just gotta wait and hope nature will balance again in our lifetimes. My prediction for 2012....a good run!! Why? Its just a guess...you can forget trying to figure it out guys...the North Atlantic Oscillation...and other theories are out the window! Too many factors that are way outta sync.